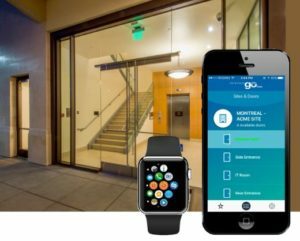 EntraPass go Pass for the Apple Watch® extends the power of the EntraPass go Pass mobile application to the iOS Apple Watch environment. Using EntraPass go Pass on an Apple Watch makes credential use even easier. Instead of searching through a bag or pocket for a smart phone, you can push a button on your watch when you enter or exit a restricted area. Using EntraPass go Pass, cardholders download the EntraPass go Pass app to a mobile device and then accept a credential invitation from the system administrator. Once the invitation is accepted, end users can then gain access to doors simply by pressing the appropriate icon of the door in the app on the device. When the application is downloaded to an iOS mobile device paired with the watch, the “go Pass” icon will appear on the watch indicating to the user that the app is now ready to be used on their Apple Watch. A list of the end user’s favorite doors will appear once the app is opened and the user can simply tap on the appropriate door to gain entry. All user activities are recorded on the EntraPass server for the system administrator.